Bubliny nelžou - iPhone film from Aquarius Pictures on Vimeo. That day started usually, as one of those normal working days. Ing. Cmiral woke up, washed his face and teeth in the bathroom – and suddenly, a strange thing happened. A bubble like from a comic book appeared above his head. Number 6 was inside the bubble. Very soon shown up the everybody in the world had a bubble, but no one knew the meaning of those different numbers. The film was shot entirely on an iPhone 5, was selected for more than 70 film festival around the world and won 14 awards till now. The story of Bubbles Don’t Lie began with a book by Czech journalist and writer Milos Cermak. When the director Stepan Etrych was looking for an idea for his next smartphone film at the end of 2014, he realized Cermak’s short stories are simply perfect to be filmed. Great storytelling with humour and unexpected punchlines. That was what he needed. Cermak agreed in one second so the production could begin. For his new film, Etrych picked the Bubbles Don’t Lie short story. It was very challenging to make a film from this the written story, because all the characters are wearing comic bubbles above their heads. Etrych shot many test shots to see the animation of the bubbles will look good. As the camera, iPhone 5 was chosen for its great HD image and possibility to use filmmaking app FilmicPro which was available for iPhones only at that time. Anyway, not only the animation skills were needed. The filmmakers also had to rewrite the story to work as a movie. The main storyline was kept – Mr. Cmiral and his wife as main characters – but it was necessary to create many new characters to fill the story with. That written story works mostly with the imagination of the reader, but the camera must show all the characters in very exact way. Before the production itself began, the screenplay was rewritten four times. the priest scene inside the Church of Saint Ludmila of Bohemia in the centre of Prague. But in another places, the filmmakers could not get the official permission for shotting, so it became a real guerilla-filmmaking. The opening shot of the scene with the nun going outside the cathedral door was shot at the first go – on the second take the guards broke the filmmaking saying „Without a permission, you can shoot outside only.“ Fortunately, the first shot was great! About 30 characters appeared in the movie, it was shot in about 20 different locations – also a greenscreen shot was used for the television studio shots. 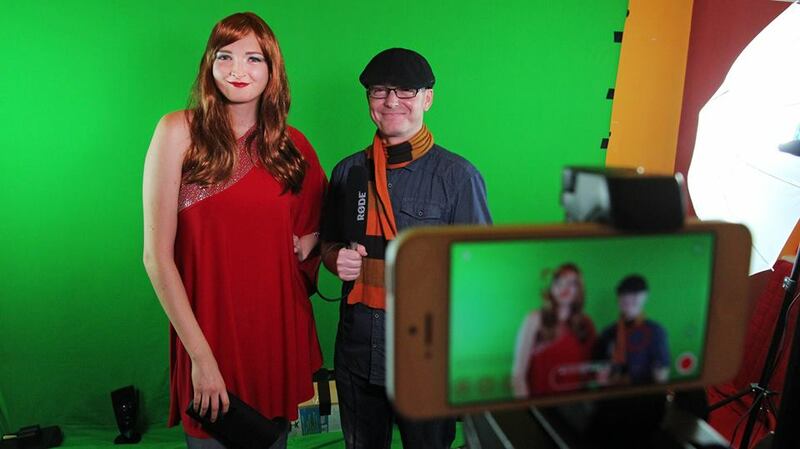 The greenscreen background was purchased on eBay for some 60 USD – and was placed in the director‘s living room for two days. In general, all the shots taken during the production were about 3 hours of rough material, doubling the 32 GB iPhone storage capacity. With all the shots done, a postproduction started and it took almost a month – the most time was consumed by the animation of the bubbles. The rough cut was 6 minutes, but director wanted the film to be even more fast paced, so some scenes and characters were eliminated. But no one of the key supporting characters, which was also quite a challenge. Once the final cut was made, with the soundtrack done, the animation part took place. It was needed to add a bubble above every head that appeared in the movie, even those tiny characters far away from the camera. Some shots consumed a lot of time – for example the ice-hockey scene appears for only 2 seconds in the movie, but it took 24 hours of work to look great. So, after a two-month hard work a 5-minutes short was finished. Its world premiere took place at the Prague Internatinal Film Festival Febiofest, March 21, 2015.